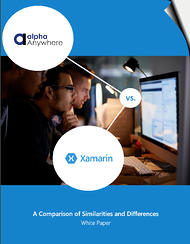 Alpha Anywhere and Xamarin are both well-respected mobile app development platforms for creating applications that run on Android, iOS, and Windows Phone. Both can (and have) been used to create powerful business applications. However, the approach they take to the mobile app development process differs in several important ways. This white paper highlights and provides examples of differences between these two platforms and aims to address the question "What is the best mobile app development tool?" Alpha Anywhere includes both the clientside tools and an application server. Xamarin includes tools only for building the client-side portion of an application. Alpha allows you to build one UI (interface) for iOS, Android, and Windows. With Alpha, at no point during the development process do you need a Mac, not even to publish an iOS application to the App Store. Xamarin requires a Mac computer to build iOS applications. Alpha allows you to build iOS applications on Windows PC. Xamarin is a code intensive solution that requires fluency in the C# programming language. Alpha allows the UI and its functionality to be defined and refined at the same time. Xamarin uses of architecture that abstracts the UI from its functionality. Alpha supports Windows Phone directly. Xamarin relies on Visual Studio for Windows Phone support. Fill out the form to receive your free copy of the 16-page white paper that details these differences with practical examples.